In the age of Internet Rap, commodities seem to be more widespread than normality. If you have a niche in terms of musical fidelity there’s a strong chance you can find one if you search deep enough. That’s where artists like Yung Lean, emerging out of the artistic meme movement, have found a community beyond joke raps between close knit friends. In one of his first videos, ‘Hurt,’ the 16 year old Lean wallowed in ironic sadness, with early aspects of the Vaporwave aesthetic glitching behind animated Pokemon, Nintendo controllers, and Arizona Iced Tea. Absurdly inscrutable, the video, and others like it, helped to birth the enigmatic artist. While this fad has never reached humanity before, the results of such acclaim have. Comedic actors known for their hilarity and wit have sometimes fought for serious roles in the limelight, with varying effect. With Warlord, Yung Lean and the whole S A D B O Y S crew attempt a similar path, eschewing their hysterics for sincerity, resulting in an album that oddly, and largely, takes the fun out of Meme Rap. Wanting to be taken seriously whilst making music constantly curated for the gags, Warlord quickly dissipates into amateur mockery. A large aspect of Lean’s style comes from the visual. Being in on the joke means you know Lean is a goofy Swedish teen, capable of making clashing video styles, and pushing idiosyncrasies atop one another at ease. It isn’t just the comedy factor, quality filmmaking appears on videos for ‘Kyoto,’ ‘Yoshi City,’ and the lead single to Warlord, ‘Hoover.’ So what happens when one half of the fun is taken out? The biggest glare remains; the music itself. 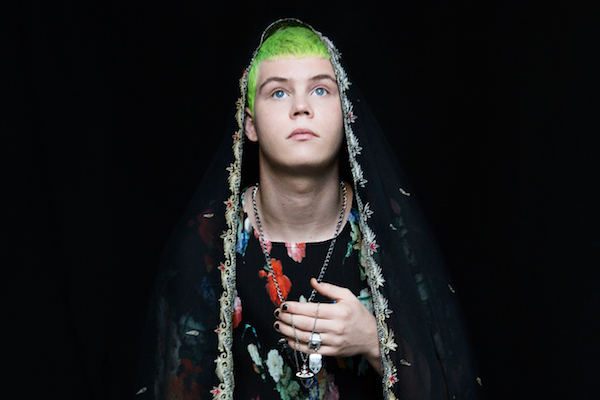 Since his inception, Lean’s rhyming and lyrical skills have been masked behind these visuals, along with the sometimes outstanding production. With Warlord that production seems interesting at first but doesn’t have much depth when pulling away the strings. ‘Hoover’ is an absolute banger, the clear standout, the best beat Yung Gud has ever done. The Industrial foundation is further boosted by the purposeful murkiness, with alarms and sirens wailing under smashing hi-hats. And surprisingly, Lean doesn’t do half a bad job over it, bringing matched ardency. On other success works, like opener ‘Immortal,’ the crew creates a track that encompasses everything the S A D B O Y S have been about; talk of blunts, chains, cars, and random nonsense fumbling over production meant to illicit flooded caverns with muddled synths and drained drums. When the production doesn’t hide Lean’s faults, but rather falls in line with them, that’s when Warlord’s true grey colors show. Tracks like ‘Fire’ and ‘Stay Down’ are just as annoying as Lean crying through autotune over them, with the bass being over modulated to the point of being obnoxious. If it isn’t the bass, which it almost always is, the tremble startles as well, on songs like ‘Shanty U Know What It Do’ and ‘Highway Patrol.’ I presume it’s one of those things where your ears would initially retreat away from the noises, like scratches on a chalkboard, before succumbing to their insistence and finally trusting their dominance. But I can’t accept that unless done properly, again in ‘Hoover,’ or even closer ‘Miami Ultras,’ which benefits from Lean’s aggressive resurgence, making the abrasive production alluring and not detracting. As far as overall amalgamating goes, ‘Hocus Pocus’ might have the best combined assets here. ‘Hoover’s’ still the standout, almost solely due to the beat, but Lean’s fading sanity over ‘Hocus Pocus’’ woozy template works in wonderful, symmetric unison. I suppose it’s when the production doesn’t have an underbelly to explain its harsh sounds that it falters the most. When Lean, through either his lyrics or enunciation, declares a purpose the picture snaps into place. In fact, it isn’t just select songs that suffer from a lack of purpose, it’s the whole album. There’s nothing to differentiate Warlord from your prototypical mixtape, with the only cohesion coming from the fact that the sound itself is so narrowed down. Bass and jutting synths compose almost every track, with woozy textures filling in the cracks, meaning that while sonically they all mesh, they only do so through sheer similarities. Ironically enough, Lean’s lack of melody in his singing and flow in his verses actually helps distance the songs from one another, because the content sure as hell ain’t. On ‘Eye Contact,’ Lean pulls out a strange, forced slang that turns concrete words into jumbled syllables. The production has no choice but to stumble in line, allowing the track itself to separate from the pact. Many songs here accomplish this feat, no matter how minimal the result is, but the point still stands that the variety in the pieces is coming from just how bad the ingredients are. The clearer analogy would be to take five pungent edibles, create five stews based off of random combinations. The results are different, but each still tastes bad, with the offshoot chance you’ll hit a goldmine. That goldmine is ‘Hoover,’ and we heard it last year. There’s other tolerable products here and there, unfortunately strewn about near the beginning and end, causing Warlord to dismantle halfway through before having one last chance to rebuild itself. ‘Immortal’ and ‘Fantasy’ at the helm, ‘Hocus Pocus’ and ‘Miami Ultras’ rounding out the caboose. If it wasn’t for ‘Hoover’ towering in the middle, the entire LP would assuredly collapse. It’s not that I hate Lean or what he’s doing, the age of Internet Rap allows for anyone to get a voice in and I respect the tenacity to achieve that. For Warlord though the odds were innumerously stacked against him from the get-go. The last thing anyone would return to a Lean track for would be Lean himself, and that’s the record’s biggest downfall. The beats outshine him, the music videos outshine him, hell even his own pity flows outshines the content and lyrics wrecking havoc along every inch of Warlord. Take away the lead, maybe turn his vocals into sporadic samples, and cut up the production in unforgiving ways and you have a quality Vaporwave album. As it stands now though, Warlord is further testament that some artists are best left for the gag reel when scouring that weird part of YouTube.